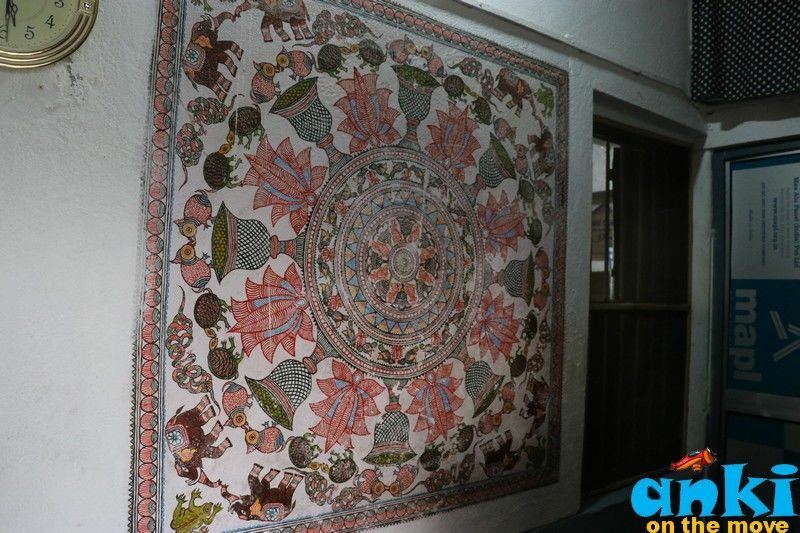 The beauty of extensive hand made painting is commendable. 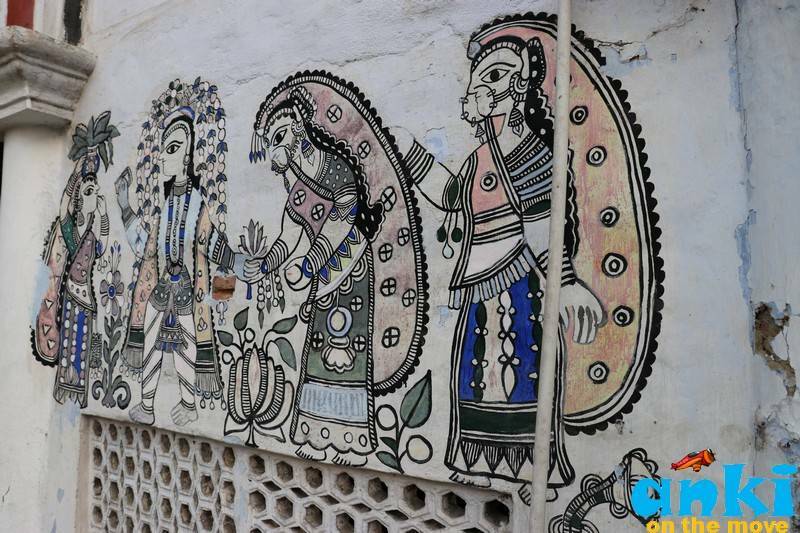 “My mother would take thread out of Sari, dip in the paint and draw a Madhubani art. She could flawlessly paint on everything with anything but mainly on paper with Bamboo pen. 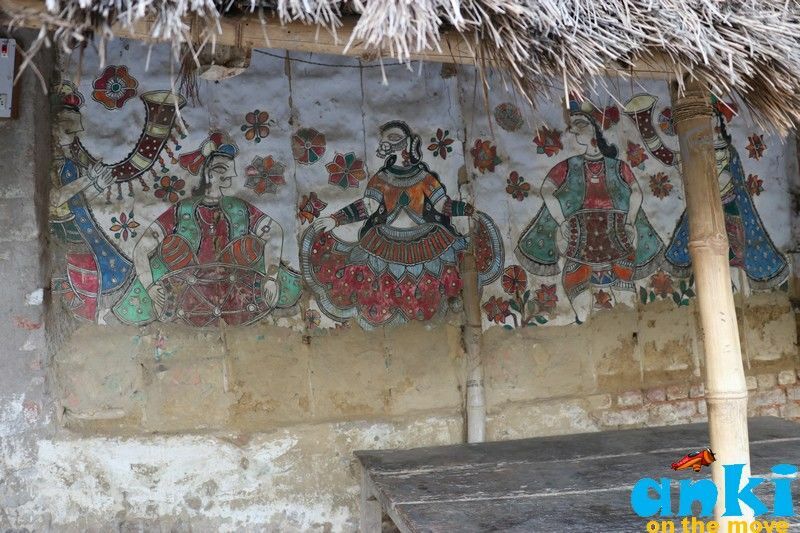 She was widely known in the village for her calibre and was respected and invited to marriages to paint Kohbar and paint other marriage rituals. Even before a few days of her death when she was aged 90+, she could recognize her paintings and could draw with free hand. 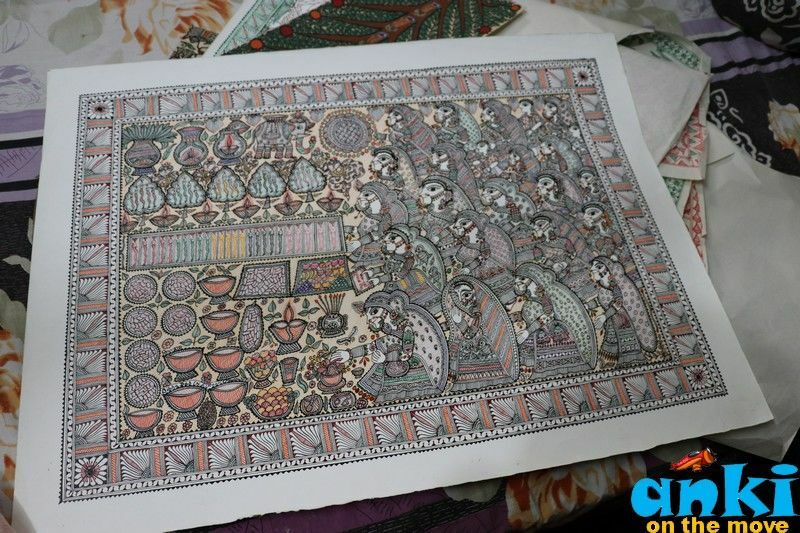 This was one of her last free hand painting - look how crisp it is.” - proudly says son of Padmashree Awardee Smt. 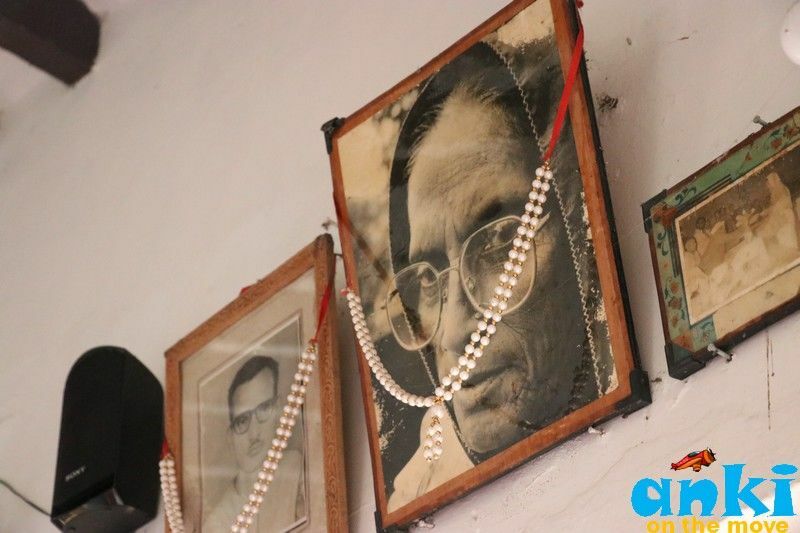 Mahasundari Das. 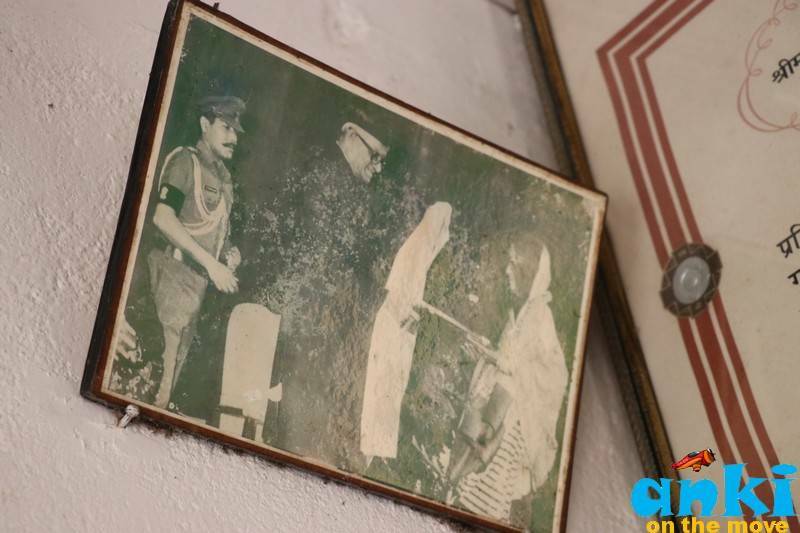 As we entered the home of Padmashree Awardee Smt. 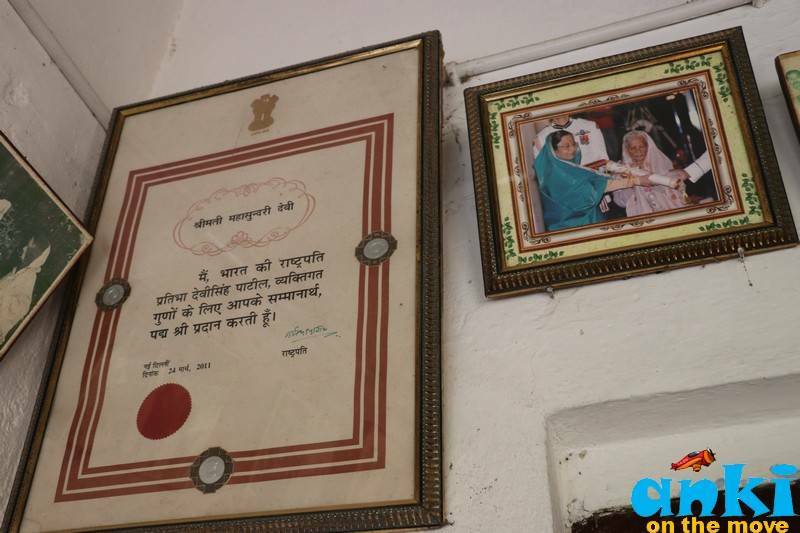 Mahasundari Devi in Ranti Village, we saw the home lined with Awards on the front wall of the entrance room . He continues “My mother got 42 awards - 4 of which were presidential awards and they are one National award, one Tulsi Samman (a prestigious award by Madhya Pradesh Government and Government of India) given by President Shankar Dayal Sharma on occasion of Tulsi Das’s 500th Birthday, Shilp Guru Award where got gold medal and a Padmashree award. We don’t have many of her work to showcase it to you only 4-5 which we have saved. Most of her paintings was on order. 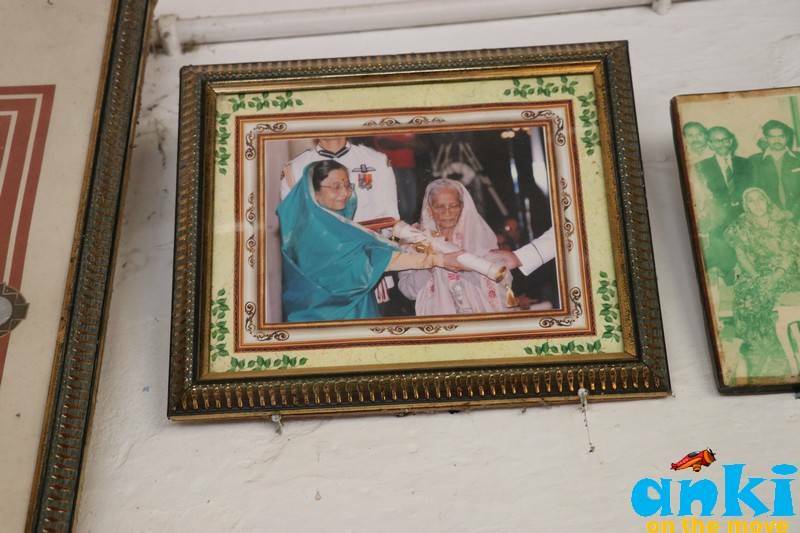 Today, the tradition is carried forward by her daughter-in-law Bibha Das, who is a national awardee herself. “Till now It has taken me 3 months of 3 hours work everyday to paint it on silk sari which I am making it for my son’s to be daughter in law (she shyly says they are still searching for a suitable daughter in law but the work on the sari has started), and it requires applying the same kind of pressure every time we use the brush and paint and intense concentration. - says Bibha. What stunned us was, there was no raw sketch prior to the painting. It was drawn free hand but the symmetry was impeccable. 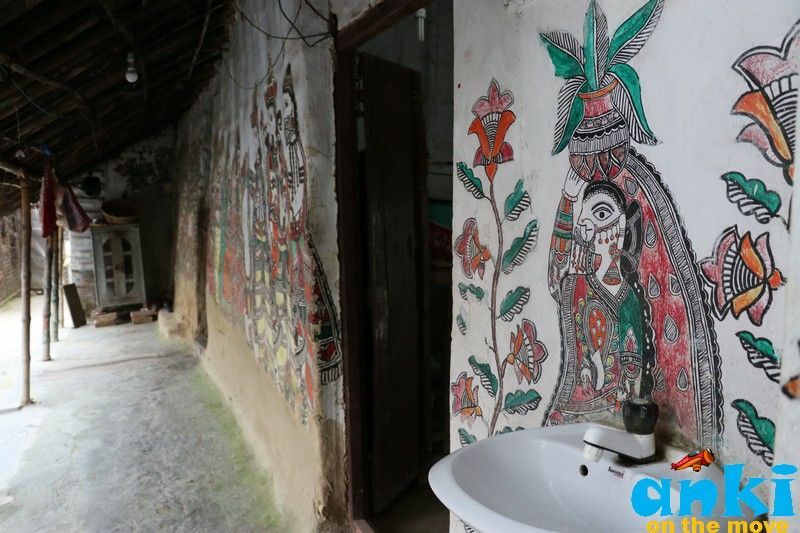 They have even preserved the Madhubani painted Mud Home, the kind of what used to exist earlier in the village as part of their home compound. 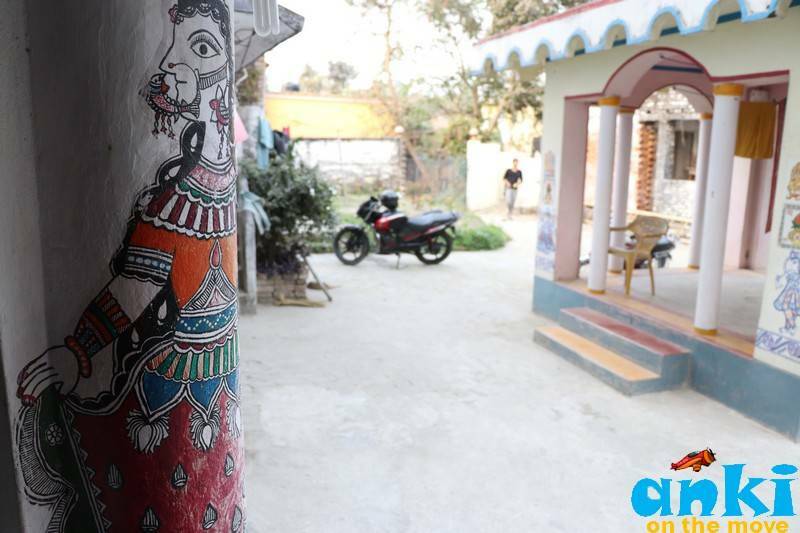 The theme on which the mud home was painted was “Shehnai” and “Dhol”. 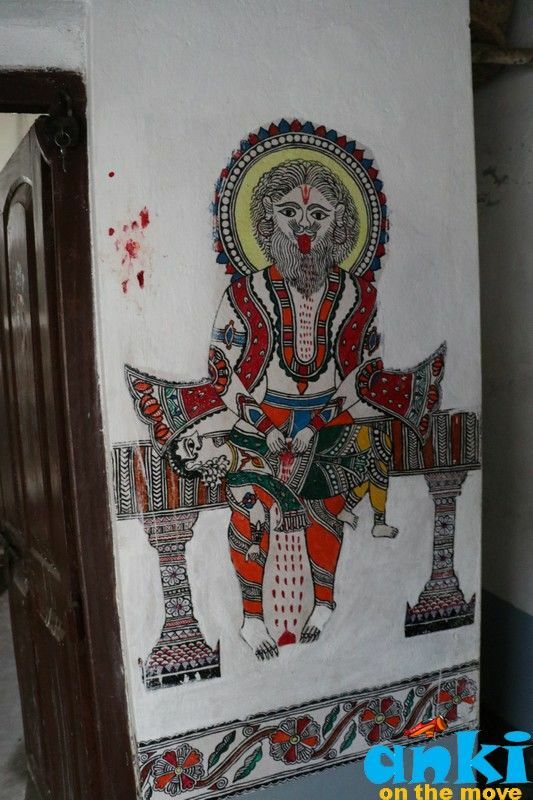 He randomly came to our home and that time my Mother was making the art, he was very pleased and he came again after a year. 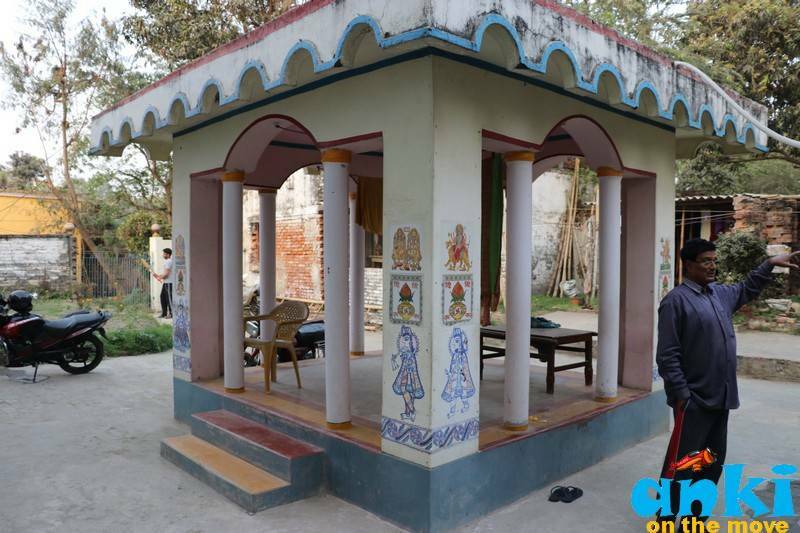 That time the Pardah System in Bihar was so prevalent that my mother said “Kaun Asabhya Admi Ghar me chala aya hai - Who is that rude guy who has come to our courtyard”, that time men in the Aangal (courtyard) was considered a big deal. The designer said, I had come last year, can you give me one of the painting. So my uncle(chacha) gave one, this painting that went after a year became the medium for more supply of paintings - and opened more doors. 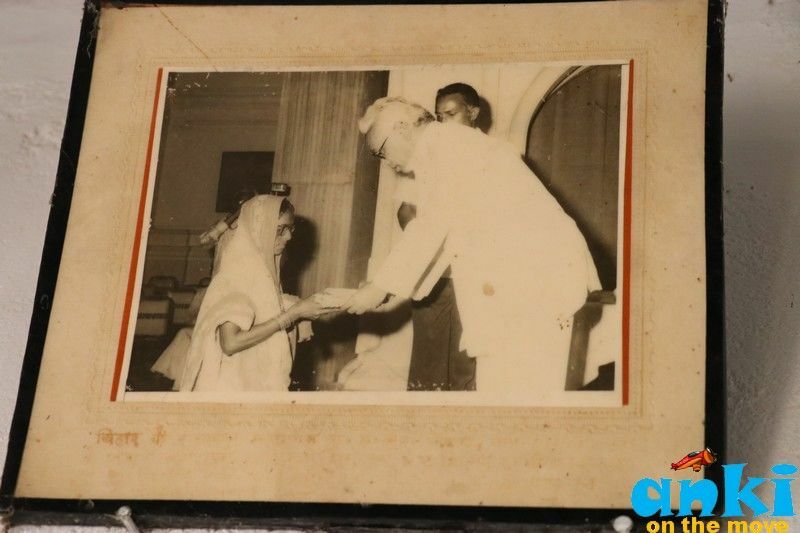 Thereafter, once she was asked to give 4 paintings and Rs 40 was given to her to buy sweets. She refused but later accepted. After that we came into Business and taught the whole village. 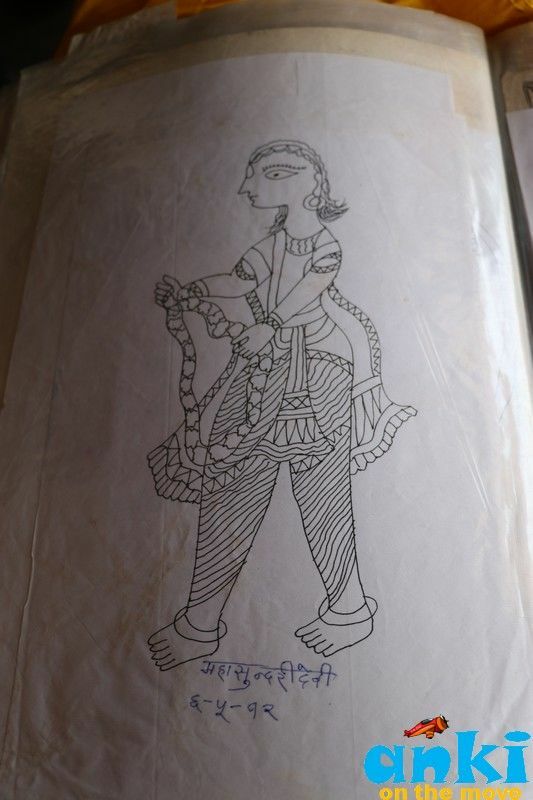 He continues that although my Mrs Bibha Das is from Leheriya Village, it was only under the guidance of my mother and me that she excelled the art. 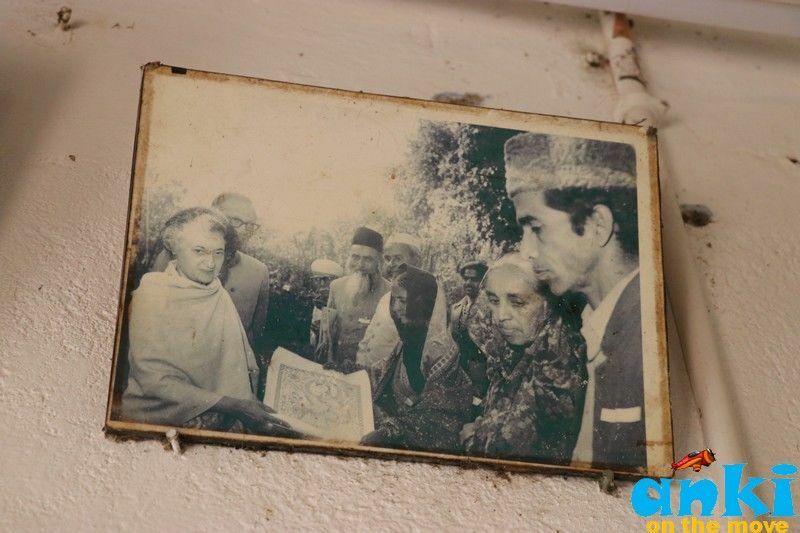 Initially she was showing less interest in the art, then she started learning after there was a training by the Indian Government under supervision of my mother. In that training, one or two family members could join and thats when she joined and started picking up the art. 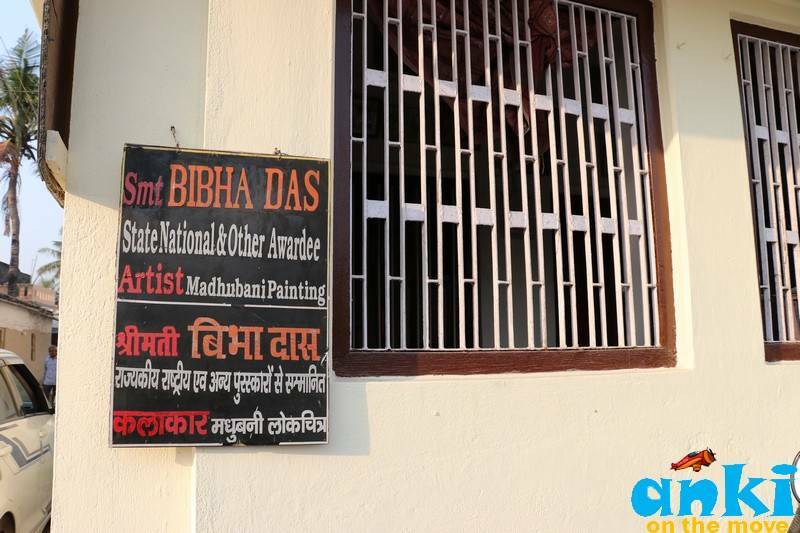 Bibha Das says that in her village, her grandmother used to make the art with Bamboo sticks and as a child she would paint here and there. 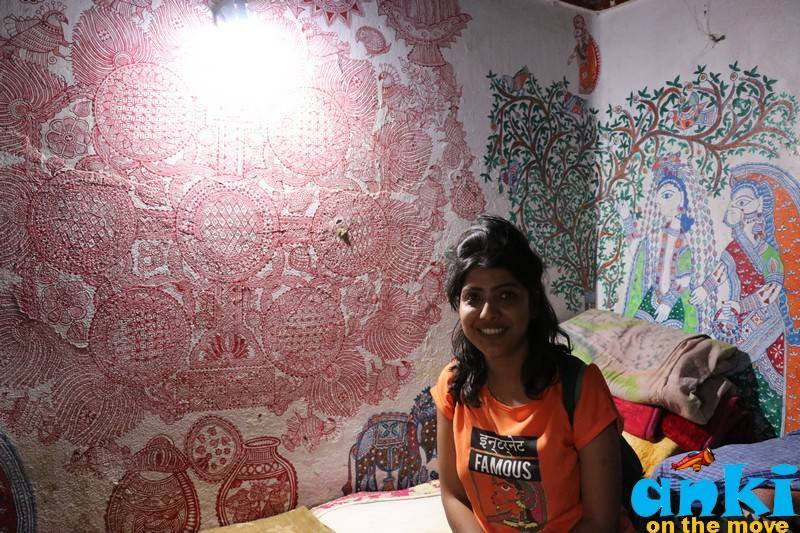 Today she paints on literally everything - Dupattas, Paper, T-Shirts or Saree.. The training that she gives to students, she keeps the best of them and sells to the market - that ways even the students benefit for their efforts. They sell from home. 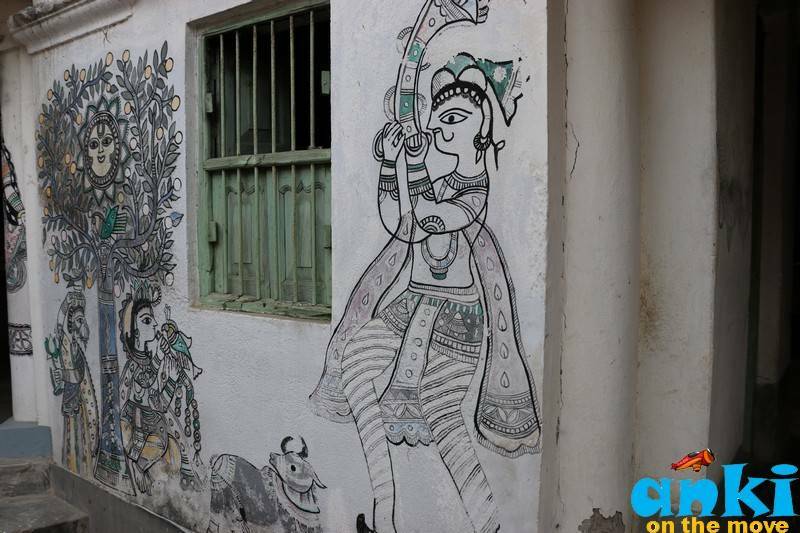 Since it is time-taking and labour intensive, he says that his interest in this art is slowly losing patience but we continue to the best we can. The difference between the work of Ranti and Jitwarpur is similar to the difference between Classical Music and Drums. Ranti has more of Line work whereas Jitwarpur has more filling work. 1) Aripan (also known as Alpana or Rangoli) : Ari means earth and Pan means Puja. It comes from the word Alepan which means Smearing and is a Puja to appease the god for earth purification. Here, they make Pithar, a paste of Arwa rice with which we make Aripan. Since rice is white and white is the color of widow they mix Sindoor or Vermillion and make it suhagan or married. 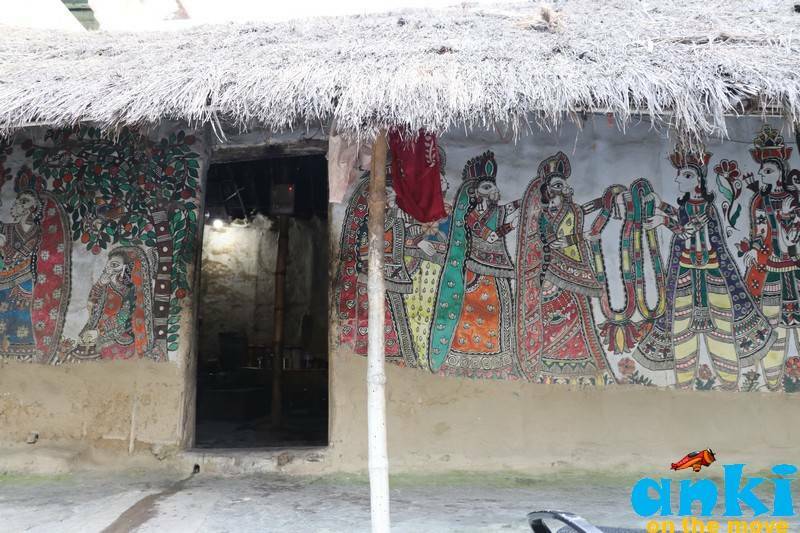 2) Phus(Hay) Home: Earlier there used to be homes made of hay because the village used to witness floods. Bamboo was plenty here and so was hay and so when these two were freely and readily available, people would help in making each others home or easily build their own. 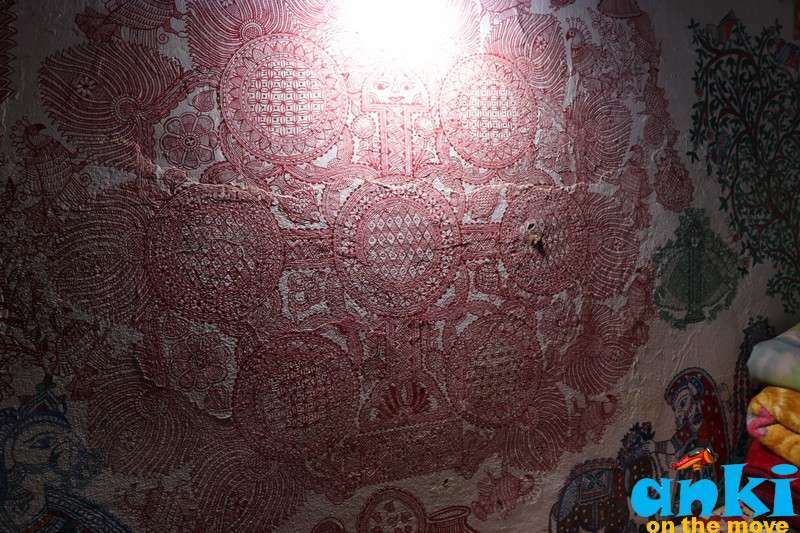 Mud was used to paste the home. Mud, however, stays for only a few months. After 3 months of pasting it with mud, it loses its strength and in 6 months falls off as a powder and a new paste was again used. Why was mud used in homes? Mud was freely available everywhere but mud came with insects. Mud mixed with Pachi ka Gobar ( as in cowdung of a cow which has recently given birth to a calf) was used because that cowdung has power to kill insects. Over that natural color was used to paint, so that the remaining insects gets killed with the natural color. The mud also provides strength to the Hay and the Bamboo. 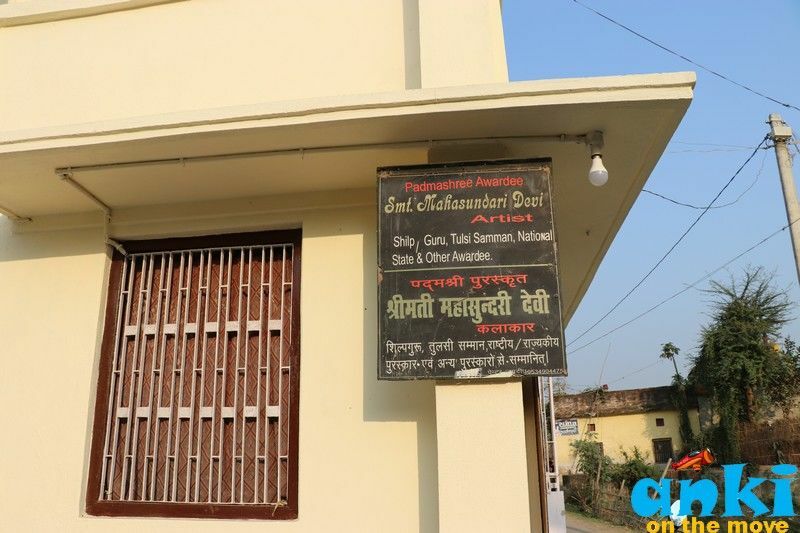 3) Tradition: A majority of people here are of Karn Kayastha caste although now people from everywhere stay here. Traditionally they are Brahmins and marry Brahmins, however it is said for centuries that our dynasties have derived from Karnataka. 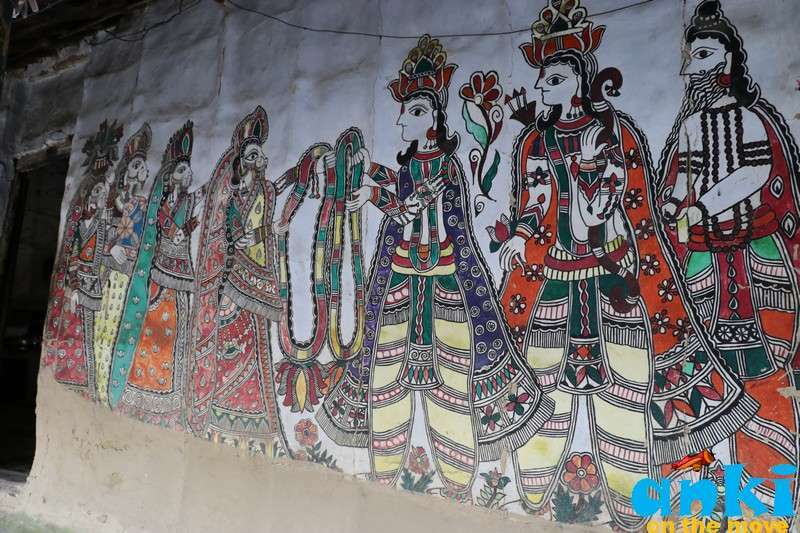 And it could be possible that they gained the wisdom of painting when they migrated , or it could also be that they gained the art of Madhubani by the kingdoms who ruled here. 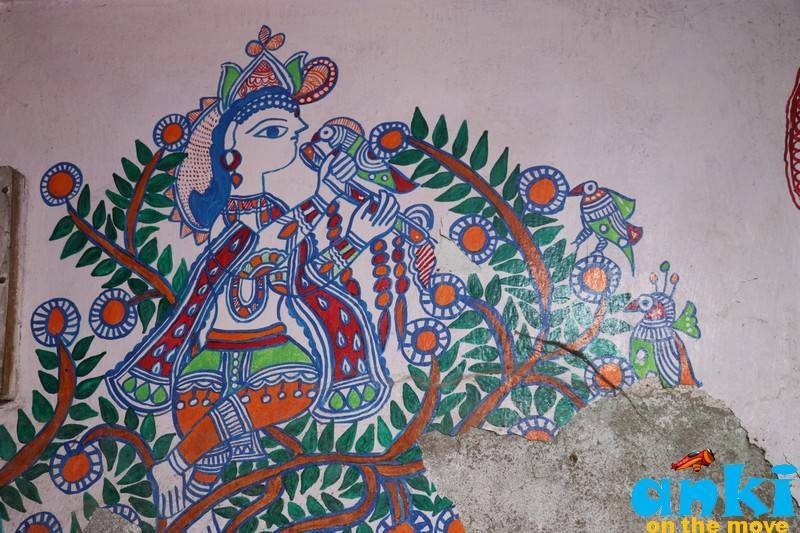 Madhubani is also mentioned years back in Ramayana. That time whatever was available whether its on leaves etc, painting was done. 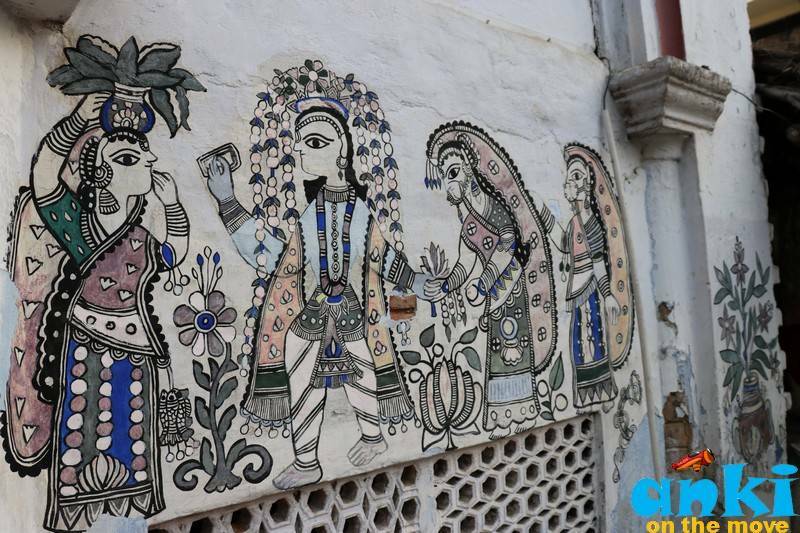 4) Marriage: There are 4 types of painting they do in Marriages -2 Kohbar , Baans, Dashavtar and Ashtal. There is a special mold in which sindoor or vermillion is filled and then a small pudiya (fold) is made. The pudiya is made in such a way that nothing falls down because falling of a Sindoor is considered inauspicious. This pudiya is opened time to time during Marriages. 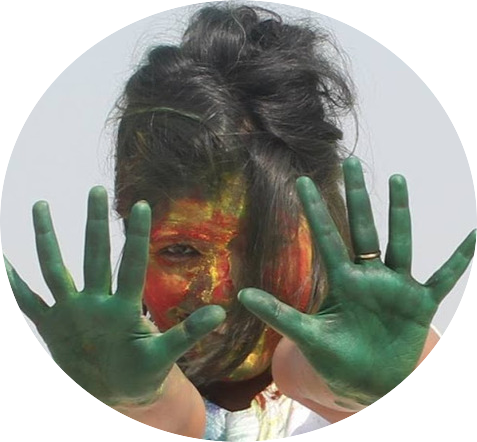 And the Kohbar sindoor is then used into girl’s maang (forehead). He says that in our marriage, the shadi is not completed on the day of marriage. 4 days after marriage there is a chaturthi process, then the shadi is completed. These 4 days is when the women had the right to reject the marriage if she does not like the guy. As there was no second marriages earlier, this was said to be for the choice a women can make in the 4 days. In those 4 days there would be no physical contact and there would always be another woman along with to testimony that till the chaturthi. There are 3 feras in the marriage, rest 4 feras are only completed 4 days after marriage in the form of mantras.We even got to see the Kohbar room where the bride stays for 4 days. 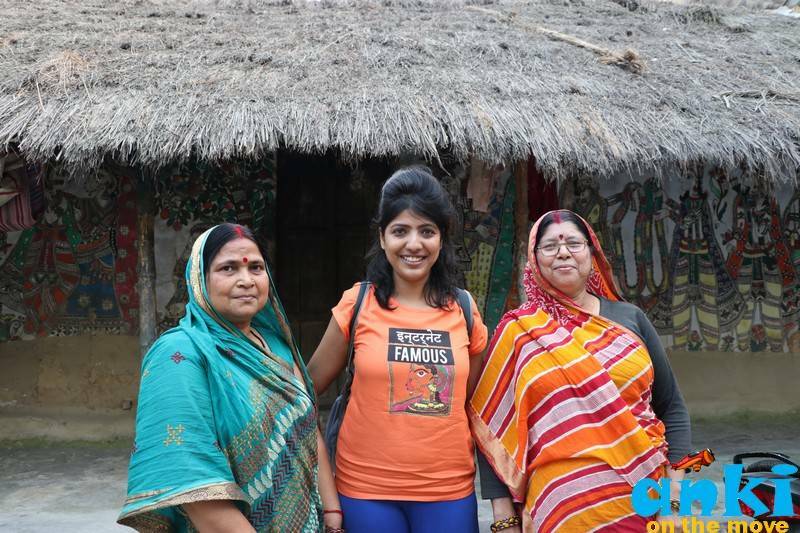 When a women gets married, the yellow sari with Madhubani painting comes from Sasural (in-laws home). 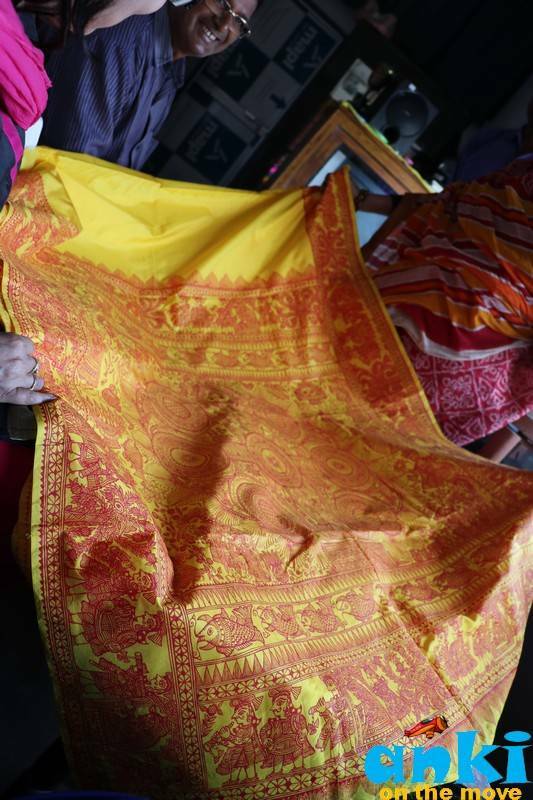 During the Baraati, the bride wears the yellow sari and goes to Sasural. 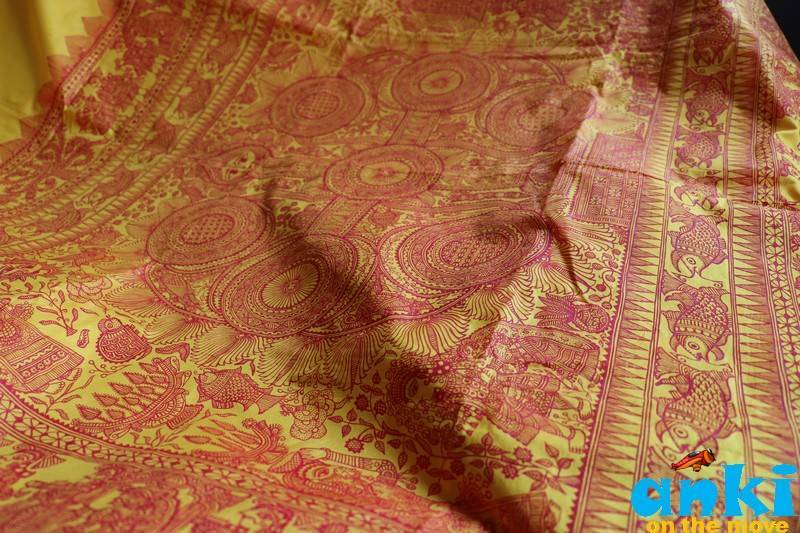 Earlier the paintings were done on Sari with Sindoor, now it is done with Fabric colors. 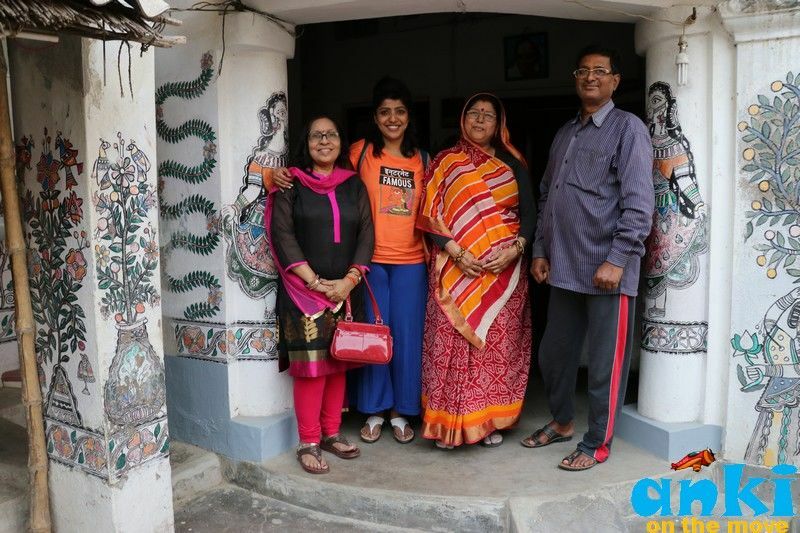 He continues "In fact when my mother made Saree for all three of her daughter in law that was with Fabric Paint"
Brilliant post, Ankita! Thank you for sharing! I look forward to reading more ports like this one! 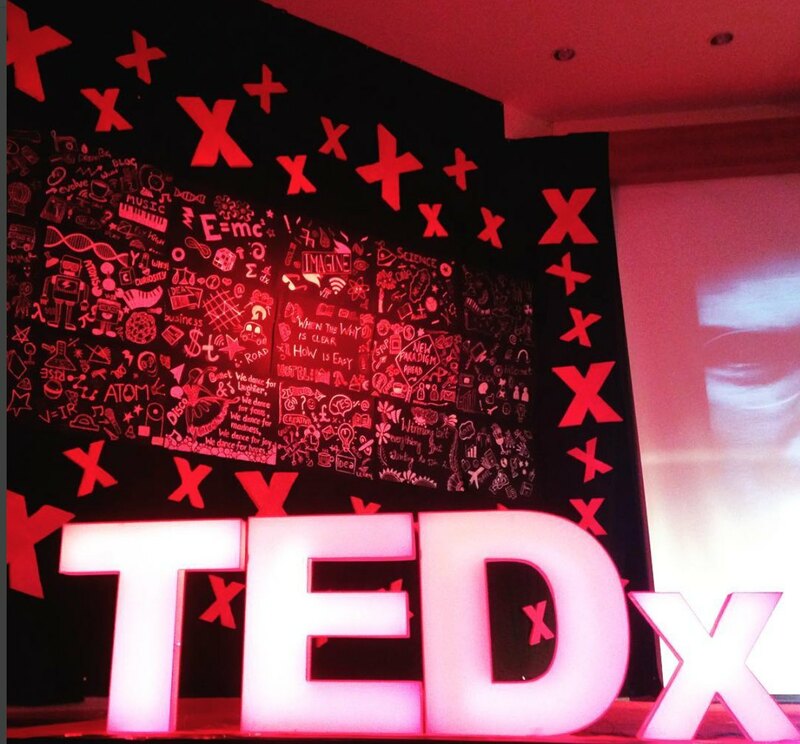 I am from Guwahati, India. 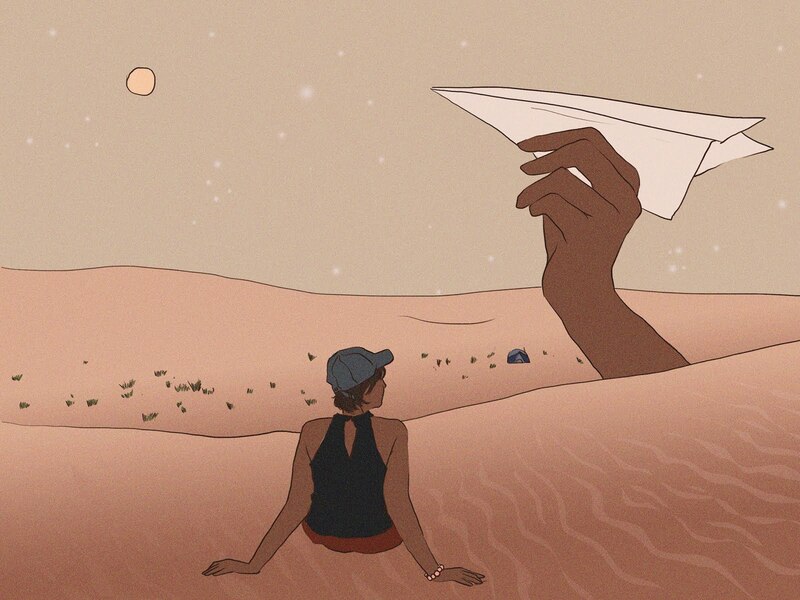 This was really a nice article. May be you could write some thing about the northeastern region of India. It is really beautiful place with lots of natural beauty. 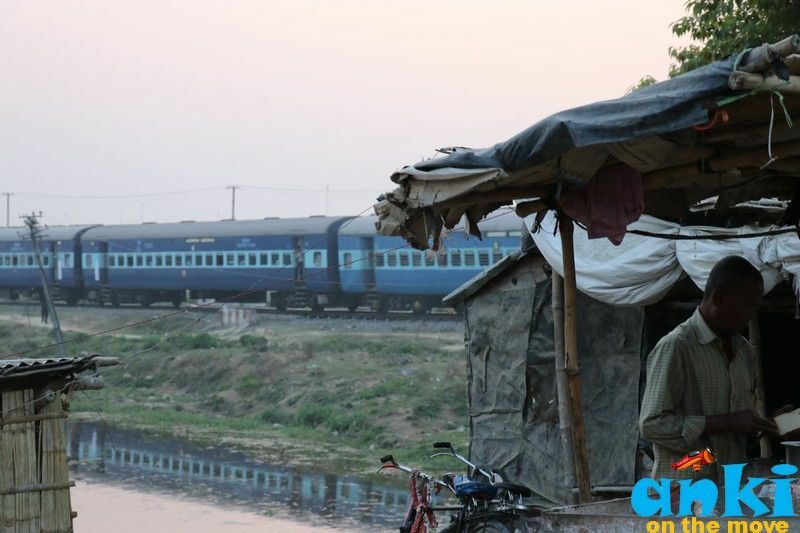 Please visit once in North East India and I am sure you will fall in love with the place. If you want we can help you to travel. For more details about the tour. We will be greatly thankful to you. 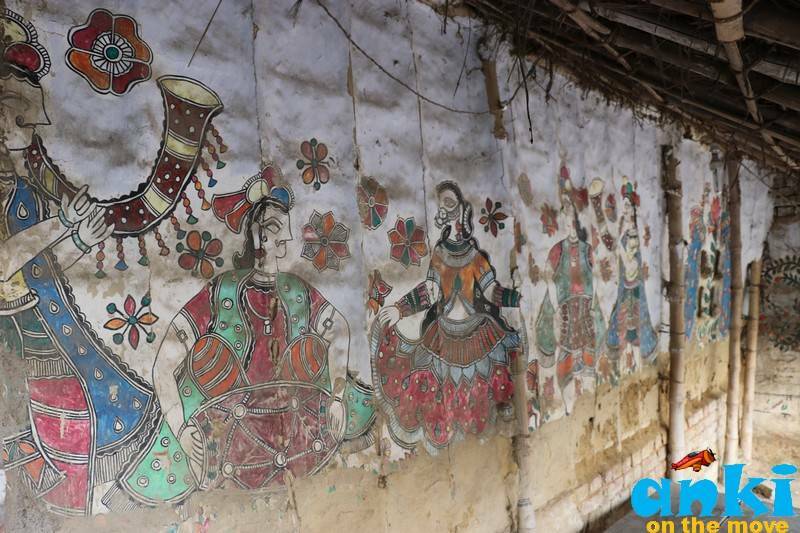 This is amazing journey for the travel exciting ranti village Madhubai painting and best pictures. This is very informative article. 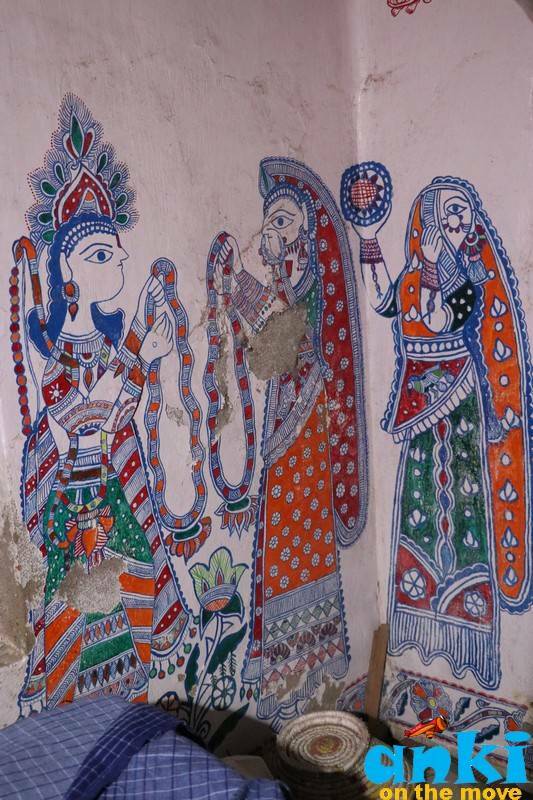 I love Madhubani art. In recent days, many practice this with artificial color and brush. Can't imagine how the artist paints without sketch and threads. Awesome! 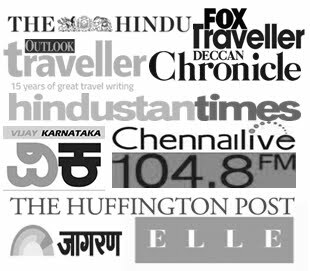 I found that it is the unique and informative blog. 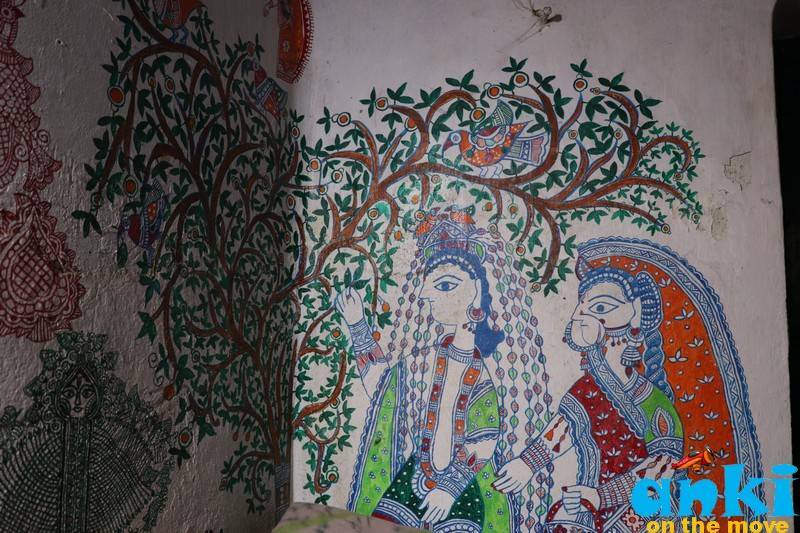 The journey of "Ranti" village and Madhubani painting are so exciting. 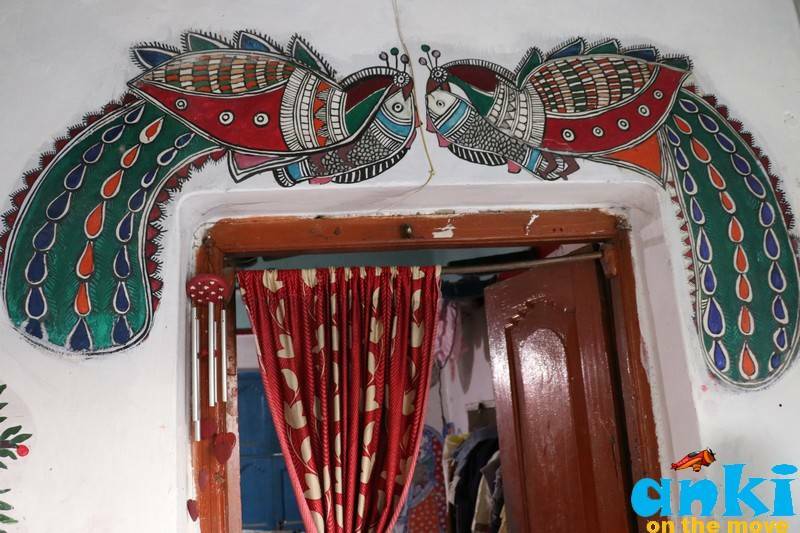 I found this blog awesome and very interesting.I was not knowing about Madhubani Painting which is in Bihar.But after reading this blog I know little bit about this Painting.The painting shown here are very beautiful and awesome. 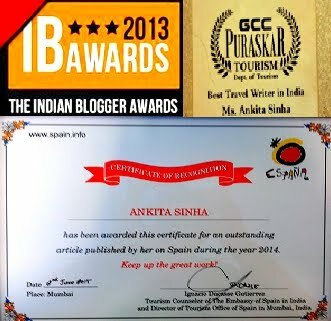 Thank you for writing such a beautiful and informative blog. Ranti Village giving me lots of experiences and memories. My journey to Ranti is amazing. Peoples in this village are very cooperative. I again want to go Ranti Village. Found this awesome blog and it's really very interesting. After reading this article I gained a little bit information about this painting.